Hey, cheapskates! I've got deals on everything from subwoofers to movies to coffee in here, so come inside and continue your penny-pinching ways with me. • Western Digital My Book 1TB External Drive for $129.99 plus free shipping (normally $150). • PQI 8GB Class 6 SDHC Card for $12 shipped (normally $18 - valid until 1/15. Use coupon code MET30P for 30% off). • A-Data 16GB Class 6 SDHC SD Card for $25.99 plus free shipping (normally $price). • VTech 5.8GHz 4 Handset Cordless Phone with Digital Answering System for $44.99 (normally $70 - valid today only). • Polk Audio PSW10 Cherry 10-inch Powered Subwoofer for $114.99 plus free shipping (normally $150 - valid until 1/20. Use coupon code EMCABBDDE for $5 off). 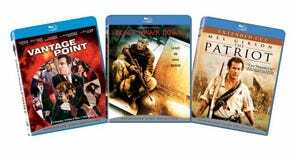 • Vantage Point, Black Hawk Down and The Patriot Blu-Ray Pack for $34.45 plus free shipping (normally $100 - valid today only). • Casino Royale, Layer Cake and A Knight's Tale Blu-Ray Pack for $34.45 plus free shipping (normally $100 - valid today only). • Ghost Rider, Underworld and Resident Evil Blu-Ray Pack for $34.35 plus free shipping (normally $100 - valid today only). • Bruce Lee Ultimate DVD Collection (The Big Boss, Fist of Fury, Way of the Dragon, Game of Death and Game of Death II) for $15.81 plus free shipping (normally $20). • Sandisk Sansa c250 2GB MP3 Player (Recertified) for $14.99 plus free shipping (normally $37). • Sandisk Sansa e260 4GB MP3 Player (Refurbished) for $39.99 plus free shipping (normally $60). • Starbucks Tall Tazo Tea Latte for $2 (normally $3-4 - valid until 1/18. Must use registered Starbucks card. Stop by any Starbucks today at 2 pm and receive complimentary drinks). • PDFzilla for $0 (normally $29.95 - valid today only). • Lexar 2GB 133x Professional CompactFlash for $0 (normally $30. Must use rebate form).